According to a new report by Moody’s Investors Service, Illinois’ unfunded pension liabilities equaled 601 percent of state revenues in 2017, a U.S. record. Illinois’ pension debt has set a new record to which no state should aspire. Credit ratings agency Moody’s Investors Service released a report Aug. 27 comparing unfunded pension liabilities across all U.S. states. According to the report, Illinois’ unfunded pension liabilities grew 25 percent in fiscal year 2017 to $250 billion. That equates to 601 percent of “own source” revenue, meaning money brought in by the state excluding federal funds. That ratio of pension debt to revenue is the highest on record for any U.S. state, according to Moody’s. The national median is 107 percent. This matters much for the same reason banks look at an individual’s debt-to-income ratio when considering applications for a personal loan. Banks typically won’t issue a qualified mortgage to anyone with a debt-to-income ratio of more than 43 percent. When a state’s pension debts far exceed its revenue, that means those debts are less likely to be repaid. 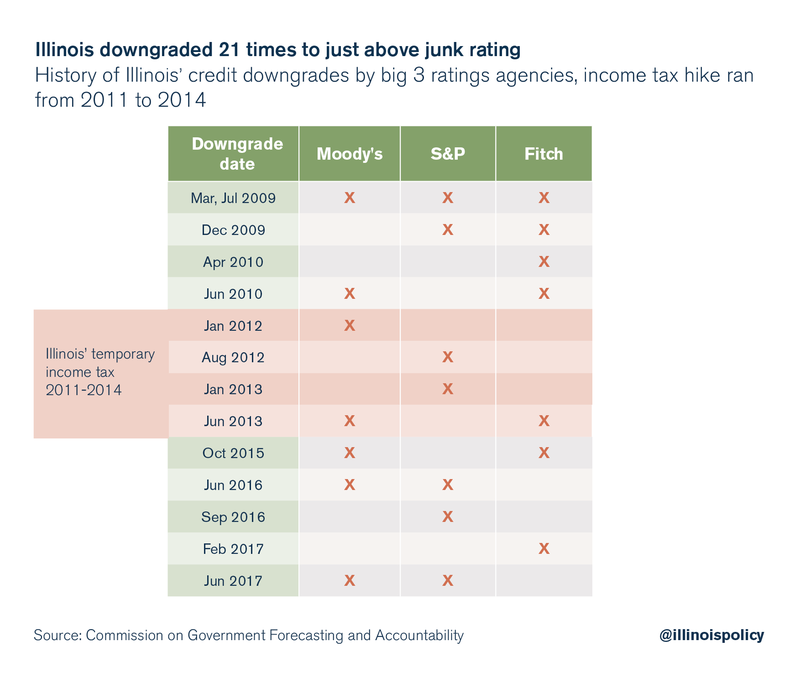 Illinois’ inability to manage its pension system in a sustainable and affordable way is one of the main reasons both Moody’s and S&P Global Ratings put the Prairie State’s bond rating just one notch above “junk” status. The state’s credit rating has been downgraded 21 times since 2009, primarily due to runaway pension debt. A low bond rating increases the cost of borrowing money for taxpayers and makes it difficult for state government to invest in core services residents want, such as needed infrastructure improvements. 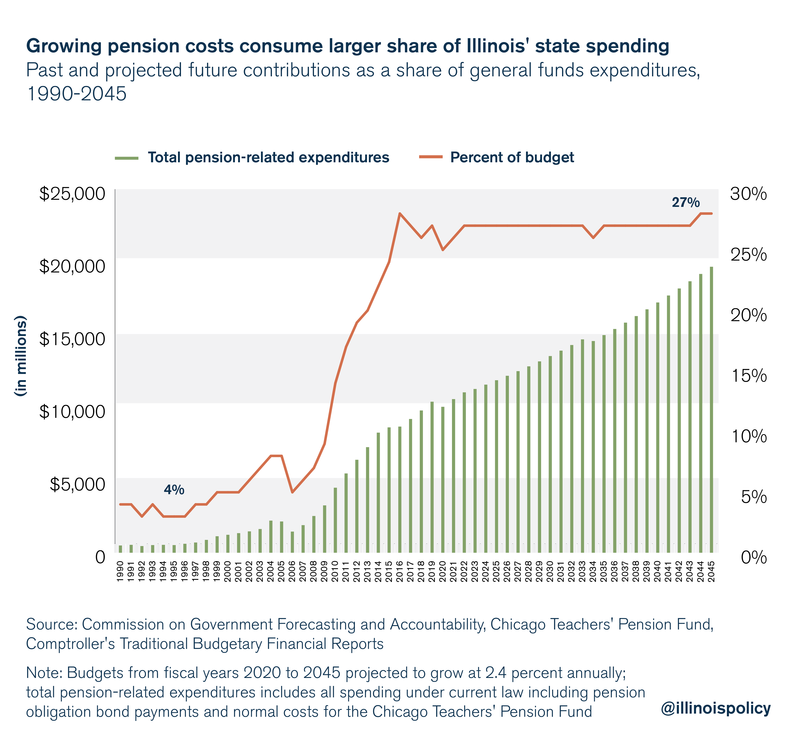 Other measures of the state’s ability to repay pension debt tell a similarly bad story for Illinois. The state has the worst pension debt in the nation as a percentage of both GDP and personal income, which are broad economic measures that indicate how much money is being brought in by the funding sources for government expenditures: individual and corporate taxpayers. A recent report from the Illinois Policy Institute, “Tax hikes vs. reform: Why Illinois must amend its constitution to fix the pension crisis,” details the threat of pensions crowding out core government services, which has led to calls for economically damaging tax hikes that can erode Illinois’ financial health. Annual state pension costs already exceed 25 percent of general revenue expenditures. If tax hikes are off the table as a solution to this problem – as they should be given Illinois’ weak economy and already-painful total tax burden – lawmakers’ only remaining options are to structurally reform pensions so that they are in line with what taxpayers can afford going forward, or to allow pension spending to crowd out government services. Crowding out effects can already be seen at the local level in Illinois. In Harvey, Illinois, pension obligations caused mass layoffs in the city’s police and fire departments. Because of a statutory provision that allows the state comptroller to intercept state money due to local governments that underfund their pensions, many other municipalities could soon find themselves in a similar situation. Over 50 percent of Illinois’ police and fire pension funds did not receive full payment in 2016, putting their municipalities at risk of facing the same choices as Harvey. The city of Peoria on Aug. 15 and 16 sent layoff notices to 27 municipal employees, according to the Journal Star, after unions rejected a cost-saving plan requesting four furlough days. According to Peoria City Manager Patrick Urich, 85 percent of the city’s property tax revenue currently goes to pensions, rather than services. Urich told the Journal Star that the round of layoffs was necessary to close a $1.5 million deficit in the city’s budget. Peoria’s 2018 budget warns, “[T]he growth in pension obligations is crowding out the use of property taxes for operations.” According to projections included in the document, the city will no longer be able to use any property tax dollars for operations starting in 2019. Public employment data from the U.S. Bureau of Labor Statistics suggest this may be a statewide problem. 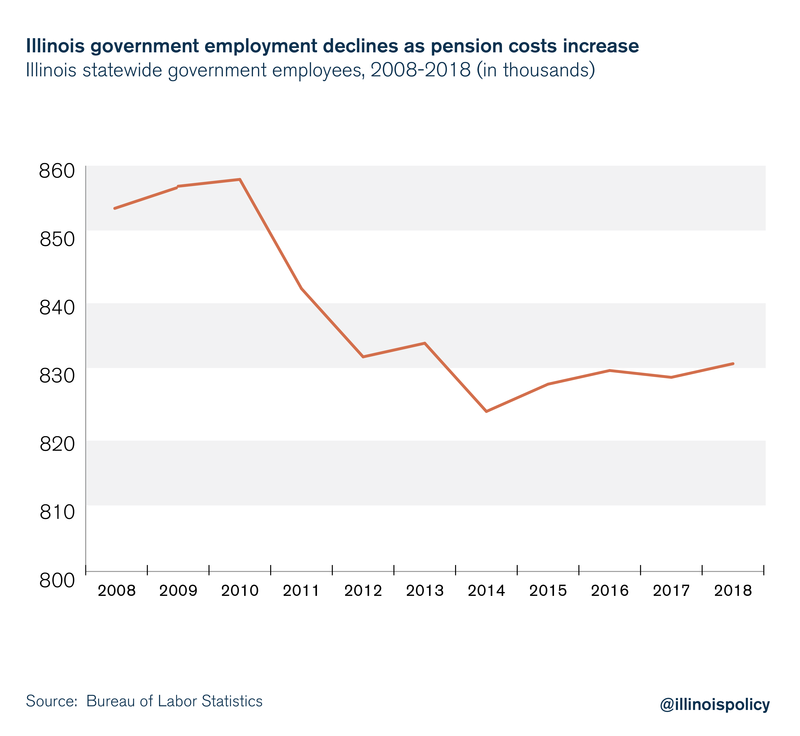 Since the dramatic increases in pension expenditures began in 2008 – resulting from the Edgar ramp – Illinois state and local government employment has been decreasing. The only way out, as Peoria’s city budget documents note, is a “comprehensive solution” from the Illinois General Assembly. To achieve balanced budgets and a strong credit rating – without gutting core services or crushing the state’s economy with more tax hikes – Illinois must amend its pension clause to make clear that while already-earned benefits are protected, future increases in those benefits are subject to change to bring them in line with what taxpayers can afford. Enrolling all newly hired employees in 401(k)-style retirement plans, similar to what’s available to State Universities Retirement System employees, which will ensure government worker retirements are predictable and sustainable going forward. Reforming future pension benefits growth through a constitutional amendment is the only way to ensure the retirement security of government workers, protect taxpayer budgets and provide core services to Illinoisans.